Steven (Chicagoland, United States) on 8 April 2019 in Landscape & Rural and Portfolio. 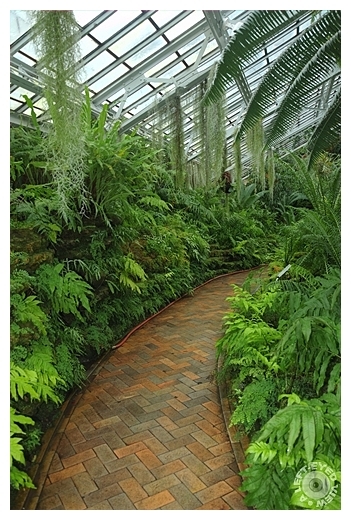 A side aisle in the Fern Room at the Garfield Park Conservatory. Spotted on February 2, 2019. Always beautiful framing and green atmosphere. All beautifully maintained . .
Green atmosphere shot! good photo! Beautiful combination the green colors and the colors of the stones. I like the hanging palm leaves. It's so green and I really like the Spanish moss there. A very well laid path to walk along and admire the plants. I like how the path draws my eye in. Aw!! This is beautiful..If I crop the top roof and just see the path and the plants...it looks lovely and lush like a tropical land ! A beautiful image and cool brickwork. An exquisite image... a jewel! I love the brick work and the pattern. The walk is beautiful through the lush greenery. Superbe passage au milieu de la verdure. They've certainly taken great care to make it a pleasant experience! Lovely comp! I sure would love to walk down that beautifully leafy green path. It is almost like the famous road of The Wizard of Oz story.